This is the second of two audio recordings from the Calvary Chapel, Santee, California Men’s Retreat. The message is entitled, “Obeying Prophecy”. This is an audio recording of the first of two messages I gave at the Men’s Retreat for Calvary Chapel, Santee California. The message is entitled, “Using Prophecy”. 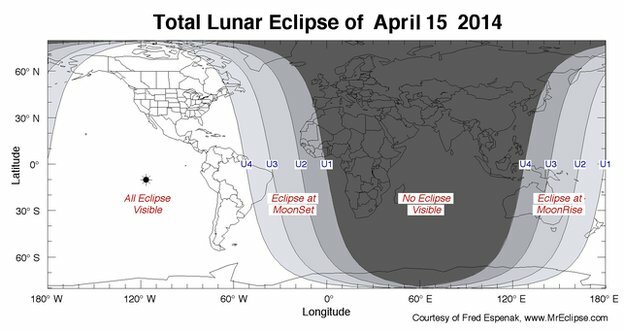 Click the link below to see where the October 8 lunar eclipse is visible. Can it be a sign to Israel if it can’t be seen in Israel? Recently a lot of attention has been focused on the fact that 2015 is a SHEMITAH year, that is, the Sabbath Year which falls on the seventh year of the Jewish Calendar. It is on this year when debts are to be forgiven and farm fields left uncultivated. The 70 year captivity of the Jews in Babylon reflected the 490 years that the Jews had ignored the Sabbath Year. The theory that the SHEMITAH years are a pattern of God’s blessing and punishments are the focus of a new book by Jonathan Cahn, author of the Harbinger, which claimed parallels between 9/11 and Isaiah chapter 9. Cahn asserts all of human history can be understood with this mystery unveiled. I attempted to calculate the 7 year intervals from 587 BC (the beginning of the 70 years) and starting the 7 year cycle anew when the 70 years were complete. The result was a completely different set of SHEMITAH years than those used by Cahn. I researched the issue in Jewish sources to learn that after the destruction of the Temple in 70 AD, after apparently a long period of ignoring SHEMITAH and the Jubilee years, the rabbis determined that the Jubilee year was no longer in effect but the 7 year SHEMITAH cycle was restarted in 71 AD. This starting date delivers the rabbi-accepted SHEMITAH years used by Cahn. Below is a timeline showing each (thus adjusted by the rabbis) SHEMITAH years in the last 115 years. Only US History events are included, because that is the focus of Cahn’s book. SHEMITAHs years are in bold. The years are in doublets because the Jewish civil calendar year begins in the fall, such that the SHEMITAH for 1973 actually begins in the fall of 1972 and ends in the fall of 1973. There are 17 SHEMITAHs in this 115 year period. Five of them roughly correspond to stock market crashes and wars, etc. 12 of the SHEMITAHs have nothing happening. Meanwhile, just counting stock market crashes and wars, there are 16 events that are of the same nature which did not happen on SHEMITAHs. So of all 17 SHEMITAH years since 1900, 12 had no reportable event and there were 16 reportable events on other, non-SHEMITAH years. I fail to see any pattern here. Challenging post about Blood Moons on Ron Cantor’s blog, Messiah’s Mandate. At this link is a good book review of Heaven is For Real. The 1493-94 blood moon “tetrad” came after, not before, the 1492 expulsion of the Jews from Spain and the discovery of the Americas. The 1949-50 blood moon “tetrad” came after, not before, the 1948 creation of the nation Israel. The 1967-68 blood moon “tetrad” came after, not before, the recapture of Jerusalem in the Six Day War. Consequently, for the pattern to be repeated it, there should have been a major event affecting the Jews comparable to what happened with the previous three tetrads BEFORE last night’s blood moon eclipse. Note also that the Arab Israeli war in 1956, the Yom Kippur War in 1973 and the Lebanon Conflict of 1981 were not signaled by lunar eclipses and so one would have expected something more significant than these to have happened before last night’s eclipse. If nothing has happened of comparable significance to the creation of Israel or the capture of the Temple Mount, than the only conclusion that can be reached is either there is no pattern of history signified by lunar eclipses. Scientist at Answers in Genesis debunks the Blood Moons as Prophetic Events theory.